Would anyone have the time to check out Karl von Barton Stedman? I have been told that he served in the 4.Garde Grenadier Regiment prior to his death in 1901. 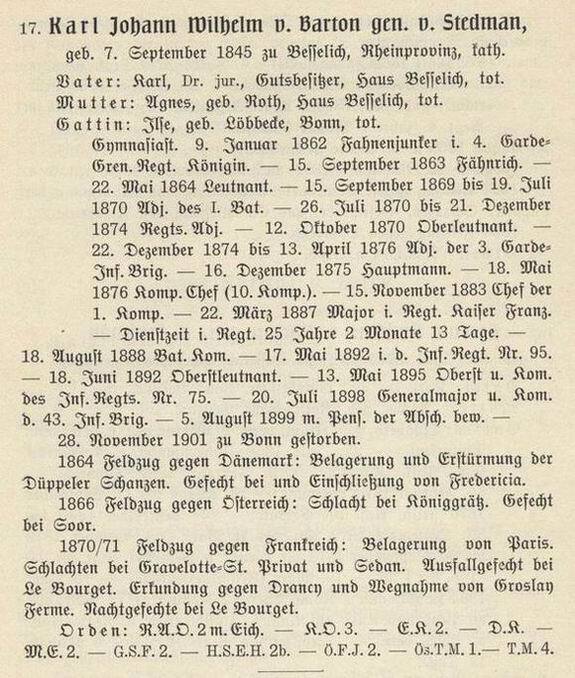 A friend has a Reichsrevolver that was his personal sidearm and was interested to know what his service history was (dates of service and promotions). Thanks in advance for any information. Generalmajor Karl v. Barton gen. v. Stedman. What does the gen. von xxxx mean? I know von means "of" and is sign of nobility, but I don't understand what the gen. is for. In most instances, a name like that means the person (or relative) was adopted. A famous example is GFM Erich von Lewinski gen. von Manstein. His mother's sister, married to a von Manstein was unable to have children. Erich was one of several children in his family, and so before he was born his parents offered him to his aunt and uncle to adopt. Consequently, he was named von Lewinski gen. von Manstein to indicate his "true" while still allowing his adopted name to be used. Over time, von Lewinski seems to have been dropped and historians tend to refer to him simply as von Manstein, though this is not entirely correct. "gen." = "genannt," or "called." I've always wondered about this family, which would seem by that combination to have somehow decamped from New England. I'm related to the Bartons (as in Clara, founder of the American Red Cross, Civil War nurse) and descended from the Stedmans of Hartford/Wethersfield, Connecticut. It seems an unlikely combination for anyplace BUT locally to me. Tip O' the Tam to Glenn. Thanks very much for the information. Would the D.K. be a Dienstkreuz or a D?ppelkreuz? He did serve in the Danish War. Any idea when he won the EK2? I think it may have been before 1870-71, so perhaps in the Danish or Austrian War? 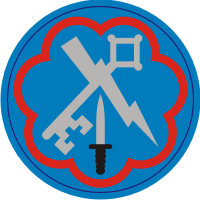 the DK is the Dienst-Auszeichnungskreuz although of course he was a a holder of the D?ppelerkreuz. He was awarded the EK2 for Sedan in 1870 whilst serving as the Regimental Adjutant of GGR 4. One last question on this subject. 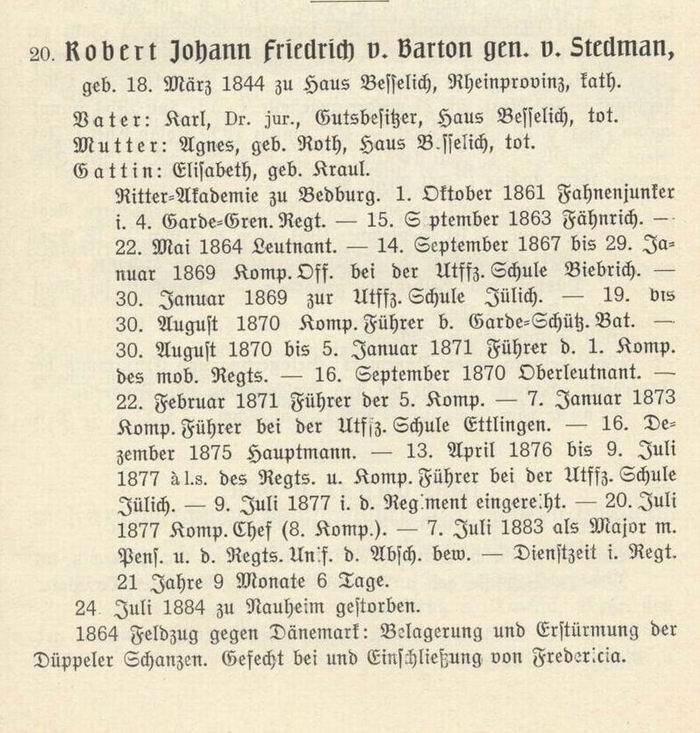 Karl had two brothers who also served in the 4.G.G.R.. Robert von Barton Stedman (died 1884) and Franz Andreas von Barton Stedman (died 1938). 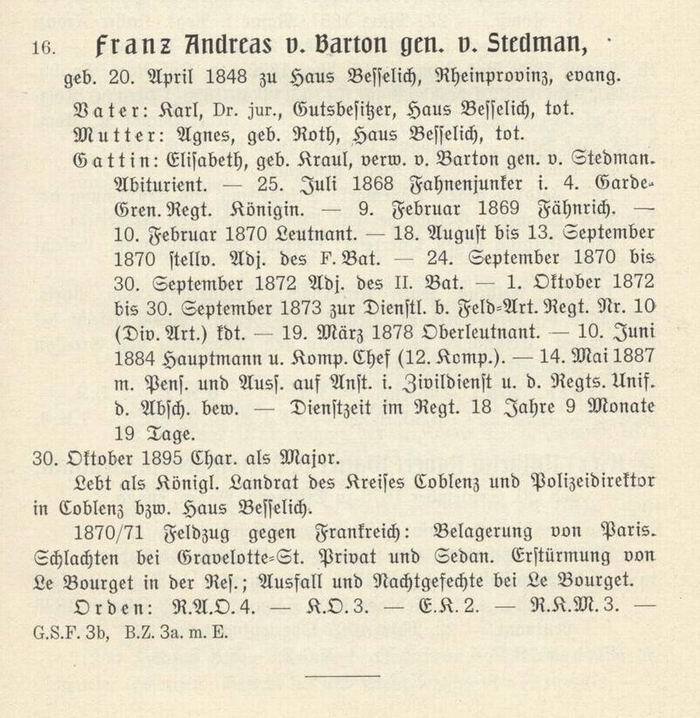 Franz Andreas may have retired from the military in 1887. Any information available on either of these two brothers? back from my Christmas travels. Thanks Glenn. What publication is this information from? all from the Offizier-Stammliste des K?nigin Augusta Garde-Grenadier-Regiments Nr. 4 by Generalleutnant z.D. Friedrich Maximilian v. Braum?ller, published by Ernst Siegfried Mittler und Sohn, Berlin 1910.